Tokyo is, by some measures, the largest city in the world. On the other hand, as you probably realize if you've ever been there, it's less of a traditional metropolis centered around one nuclear, and more a compilation of smaller cities, each with its own unique character and flavor. It's difficult to overstate the importance of Asakusa district, both because of its general popularity among Tokyo travelers, as well as the wide range of attractions there. 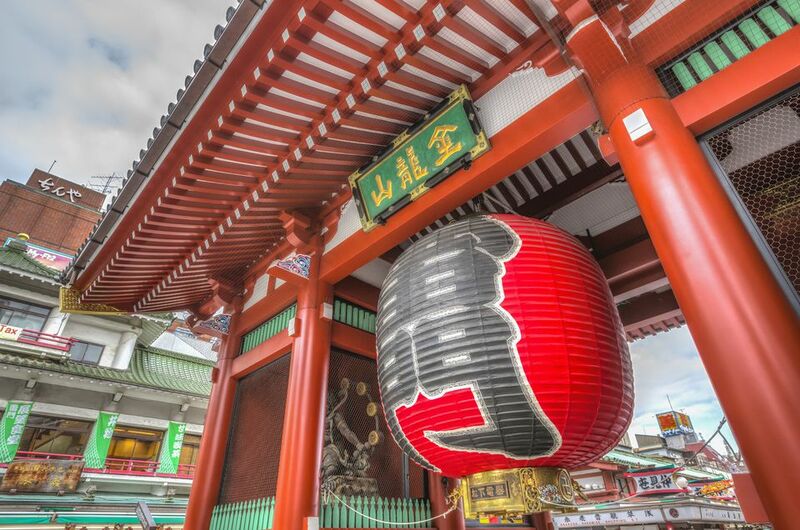 Consult this guide before you make the trip to Asakusa to make sure you don't miss anything! Most of what you see upon arriving in Asakusa is decidedly futuristic (more on that in a second), so it might surprise you to learn that the best way to see this district is by rickshaw. And not just any rickshaw (which is an antiquated form of transport even in a motorized "tuk-tuk" form), but perhaps the most traditional sort of all: Pulled by young men using only the strength of their bodies. In addition to being a charming way to see Asakusa, riding in a rickshaw also paints the most extensive portrait of the district. Since many of the drivers are either local or intimately familiar with Asakusa, you'll be treated to trips down seemingly random alleyways that might prove to be the greatest treasures of your entire Japan itinerary! Of course, the Japanese go to great lengths to be faithful to original architectural and design principles whenever they have to re-build something. Senso-ji will charm you as if it's original, even though it's not. Rickshaws and temples aren't the only relics of the past you'll find in Asakusa, either. The district's excellent museums help you piece together a picture of what Asakusa was like during Japan's Edo period (and even earlier), presenting an alluring survey of art, cuisine, culture and beyond. Edo Shitamachi Traditional Crafts Museum, for example, not only showcases handicrafts that were popular during the Edo period, but provides an arena for modern people who still practice these arts to showcase their skills and sell their products. Amuse Museum, on the other hand, focuses on performing arts from the past and present, and is even home to a functioning Ukiyo-e theater, which spotlights dramatic art made in this beautiful "woodprint" style. It's difficult to say exactly where in Japan tempura comes from. After all, this deep-fried delicacy only began after foreign traders began arriving in Japan after its ports opened in the mid-16th century after hundreds of years of isolation—in some ways, it's the earliest form of fusion cuisine. With this being said, the array and quality of tempura in Asakusa is truly impressive. For a more casual experience, have a quick lunch at Tentake. Daikokuya, on the other hand, is best experienced at dinner and provides the fried cuisine in a surprisingly classy setting. While it's difficult to find sumo matches in Asakusa proper, the veritable home of sumo is just next door, in Ryogoku district. Given the size of Tokyo and the distance between its wards, you can think of this as something amazing to do in Asakusa, even if you technically have to exit the ward. You'll need to plan relatively far in advance (and be prepared to dedicate several hours of your time—the matches are not quick!) if you want to take in a full sumo fight at Ryogoku Kokugikan stadium. Other options exist, however, whether you book a tour to watch a morning sumo practice, or simply ask one of the sumo wrestlers you're sure to see on the streets here if you can take a photo with him. The general feel of Asakusa is modern-to-futuristic, as mentioned earlier. If there's one structure that embodies this aesthetic more than any others in the district (or in Tokyo at all), it's the Tokyo Sky Tree, which sits just a few minutes by foot (even fewer by rickshaw) from Asakusa landmarks like Senso-ji Temple. Whether you admire this 2,080' behemoth from the ground, or go up to the observatory to enjoy what is without a doubt Tokyo's most impressive panorama, it's a must-see during the time you spend in Asakusa. Of course, not all the great views in Asakusa are from particularly high, or allow you to see all of Tokyo. To be sure, if you simply want to enjoy a bird's eye view of Asakusa's most important landmarks, you can head the rooftop of the Asakusa Culture and Tourist Information Center. In addition to being free to enter, it allows you to hone in on the sights of Asakusa itself with your aerial photography, to say nothing of the fact that it's un-intimidating if your fear of heights precludes you going up in the Sky Tree. Most onward journeys from Japan's capital begin from busy train stations like Tokyo, Shinjuku and Shinagawa, and use trains operated by the national Japan Rail (JR) company. While you can technically get to the UNESCO World Heritage city of Nikko (arguably most picturesque Tokyo's best day trip) using JR trains from Tokyo station, the most direct way to get there is to ride the private Tobu line, which leaves from Asakusa station. Tip: Unless you manage to get these other amazing things to do in Asakusa out of the way before lunch time, it's better to stay the night here, and set off from Asakusa station to Nikko the next morning. Both of these places are so full of history that rushing either would do them a disservice!